With our commercial building contractor services, we bring everything we have to offer to you and your Mooresville, NC business. 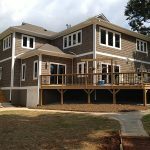 Commercial Building Contractors in Mooresville & Lake Norman – Commercial building projects can offer a very different challenge than residential properties. While it is important that general building requirements are met, there is a significant amount of time and thought that must go in to meeting the overall goals, personality, and mission of the company. Every detail is significant in the success of your business, and we understand that. We work hard to ensure every aspect of your building design is catered to your desired customer experience, from floor plan to hardware and everything in between. A main factor in the success of our commercial building contractor services is our relationship with local vendors and architects. As a commercial building contractor, we serve as an open communication line between both parties, guaranteeing a unique and beautiful project that will meet the needs of you and your business while also offering the grandeur of a successfully designed and completed structure. With us at Chad Goodin Signature Homes, communication lines are always open. Even before the project begins, we have a firm grasp on what the needs of your business are and will make sure you understand clearly what you can expect from us. We believe in providing quality and dependable service at every point throughout the process. With our commercial building contractor services, we bring everything we have to offer to you and your business. With more than 30 years of experience in technical and integrated design, we will plan a project to meet your every expectation. If you are located in the Mooresville, NC area, trust us at Chad Goodin Signature Homes to make your vision a reality. At Chad Goodin Signature Homes, our commercial building contractors proudly serve Mooresville, Cornelius, Davidson, Huntersville and the surrounding Lake Norman area of North Carolina.